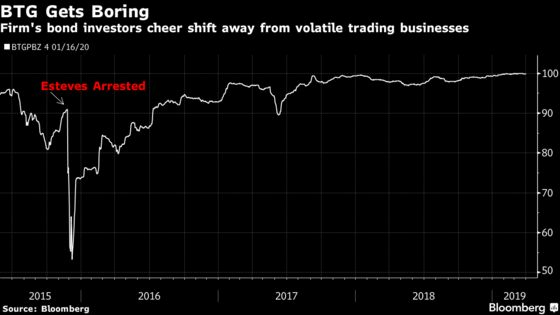 (Bloomberg) -- Banco BTG Pactual SA, the Brazil investment bank whose volatile sales and trading operation once generated almost half the firm’s revenue, has a new message for investors: Things are getting dull. Chief Executive Officer Roberto Sallouti has been stressing the strategy shift in recent pitches to investors, highlighting how BTG is de-emphasizing trading and principal investments in favor of asset and wealth management. 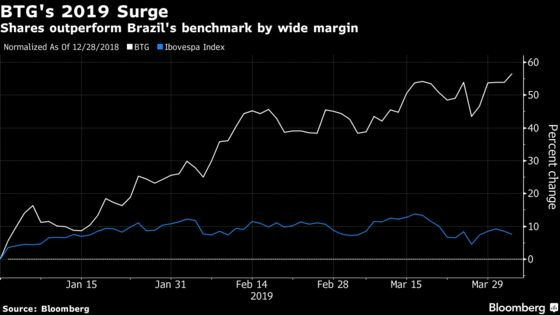 Investors are responding: Shares of the company have surged about 57 percent this year, beating Brazil’s benchmark stock gauge by a whopping 49 percentage points. “It’s a positive shift that’s helping the bank have more predictable revenue by leaning into businesses with more recurring and sustainable gains," Ceres Lisboa, a senior banking analyst at Moody’s, said in an interview. "BTG will always have a spice of volatility in its results, as it will always be an investment bank, but it’s taken actions to curb that volatility." BTG has almost completely abandoned the principal-investment business, which dragged revenue down 1.18 billion reais ($305 million) in 2015 on losses stemming mainly from investments in companies such as oil-rig venture Sete Brasil Participacoes SA and drugstore chain Brasil Pharma SA. Revenue from sales and trading sank to 29 percent of the Sao Paulo-based bank’s total last year, from 49 percent in 2016, according to the company’s financial statements. Taking up the slack are asset- and wealth-management operations, known for their stable stream of fees. Those businesses now represent 22 percent of total revenue, compared with 15 percent in 2017. And BTG is stepping up efforts to cater to retail investors through a digital platform. That helped the businesses attract record net inflows of 67.5 billion reais in 2018, as historically low interest rates in Brazil lessened the appeal of government bonds. In the previous year, the bank brought in less than a third of that sum. In its discussions with individual investors, BTG is taking the opportunity to sell its own bonds. Retail investors, who previously owned almost none of the company’s debt, now represent at least 10 percent of the bank’s total funding, according to a person familiar with the matter who asked not to be identified because the figure isn’t public. Recent investments in the asset-management business include the hiring in February of BlackRock Inc. veteran Will Landers to lead equity strategy and the launching of a new Latin America equity fund. Eduardo Guardia, Brazil’s former finance minister, will become the unit’s CEO by mid-year. As part of the move to lessen its reliance on trading, the bank is planning to sell what’s left of a volatile commodities business. Engelhart Commodities Trading Partners plans to buy back the 20 percent stake owned by BTG when its earnings start to rebound from a slump, Sallouti said in a February earnings conference call. He said that would “hopefully” happen in 2019. The spinoff of the unit began in April 2016, when BTG reduced its holding to 36 percent from 92 percent, with the stake purchased by the bank’s partners and Engelhart’s managers. The decision to start selling the commodities business came in the wake of the arrest of former CEO Andre Esteves in a corruption probe in late 2015. To survive the ensuing crisis, which tanked the company’s shares and bonds, BTG also unloaded more than $3.5 billion in assets from the principal-investments business. And seven partners including Sallouti used a share swap to take control of the bank. They granted Esteves non-voting stock for part of his voting shares, leaving him as the biggest shareholder with a stake of about 30 percent, but out of the controlling group. Esteves was acquitted last year after the prosecutor’s office said there was “no sufficient proof” against him. Since December, he’s been back in the controlling group along with four other partners.